Beginner Drawing Art Kits - Learn to Draw! There's a new selection of Pencil Drawing Kits from Walter Foster in the Paint & Draw Art Kits section of the store. Learning to sketch and draw is easy with complete art kits that include everything you need to get started. Whether you're interested in drawing people, horses, animals, or you just want to learn general drawing skills, there's an art kit here for you! 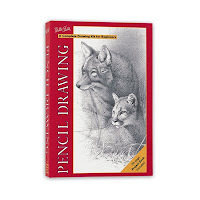 Each of the beginner drawing kits shown below includes a 32-page project book that will teach you how to draw your chosen subject matter with pencils. You'll learn basic sketching skills as well as more advanced drawing techniques, including tips for holding the pencil, applying shading, and creating the appearance of depth. Step-by-step projects will guide you through the process of drawing with helpful instructions and detailed illustrations. These art kits include all the quality artist's tools and supplies you'll need to get started! You'll receive a generous variety of drawing pencils, blending stumps, tortillons, a sharpener, eraser, sandpaper block, drawing paper, and more, depending on the particular kit. Click the links below for details on each kit's contents. Learning to draw people is a challenging yet rewarding artistic skill to master. Capturing the likeness of someone you care about will make it well worth the effort. 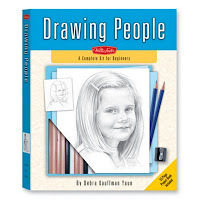 The Drawing People Art Kit from Walter Foster makes it easy to give it a try! The step-by-step projects include people of varying ages. This kit includes an anatomical mannequin to guide you through lessons on the human anatomy. Learning to sketch and draw people is easy with this drawing art kit for beginners! There's something about horses that just makes us want to learn to draw! I remember drawing horses for hours with my sisters when we were young girls. More recently, I've watched both of my daughters do the same. Horses are a captivating subject matter to draw with pencils. You'll learn to draw different types of horses in varying profiles and in motion. This kit includes a black marker, black watercolor paint, and paintbrush to further enhance your drawings. 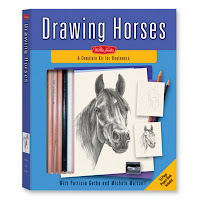 This is a great art kit for anyone with the desire to learn to draw horses! The next 2 pencil drawing kits are smaller in format, ideal starter sets for learning to draw and convenient for travel. 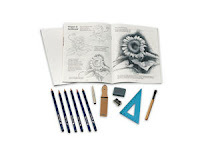 The Pencil Drawing Art Kit teaches you how to draw a variety of subject matters. Learn to draw a sunflower, kitten, house, and more! This kit includes an artist's triangle to ensure straight lines and correct proportions when needed. You'll learn to draw a variety of animals with the Drawing Animals Art Kit. 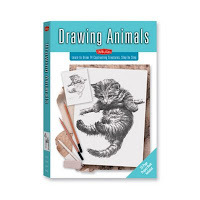 The project book includes lessons for drawing 14 animals, including cats, dogs, a kitten, rabbit, giraffe, elephant, and more! Walter Foster is a trusted brand, known for producing high quality drawing supplies for over 80 years. Art kits are a creative gift to give any aspiring artist, including yourself! You'll find a great selection of Walter Foster kits at Weekend Kits. Visit the Paint & Draw Art Kits to see our complete collection of beginner art kits and get ready to learn to draw on your next Weekend at Home! Learn to Knit Kit DVD & Crochet Baby Blanket Kits! It's the perfect time of year to learn to knit and crochet! School is back in session and the return of cooler weather is near. Create hand knitted hats and scarves to stay warm this winter! 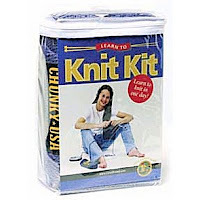 We have a great selection of beginner knitting kits in the Knit & Crochet Kits section of the store. These beginner kits include everything you need to get started! Learn to Knit Kit & DVD - I Can't Believe I'm Knitting! We have the new I Can’t Believe I’m Knitting! Kit & DVD from Leisure Arts. If you prefer to learn by watching someone knowledgeable demonstrate the techniques first, then you'll really appreciate this learn to knit kit - it includes a 100 minute instructional DVD, featuring knitting expert Melissa Leapman! This knitting DVD makes it so easy to learn how to knit! The auto-pause feature allows you to set your own pace and the alphabetical index makes it convenient for you to look up specific topics when you need them. 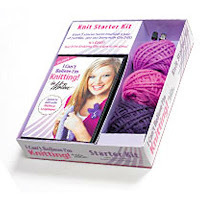 This complete knit kit also includes a pair of knitting needles and 3 balls of yarn to get you started! We've added to our selection of Lion Brand Learn to Knit Kits with this kit that teaches you how to knit a Denim Hat & Scarf! This is a complete knitting kit for beginners, including 10" knitting needles, a yarn needle, and Lion Brand Chunky USA denim yarn. You also receive an illustrated learn to knit instruction booklet and easy beginner pattern. The denim blue yarn color creates a warm and casual look that will look great with jeans. And, when you're finished with your first knitting project, you can use the knitting needles and pattern to make additional hats and scarves for family and friends - you'll have fun finding yarn in all of their favorite colors! Learn to knit with confidence when you buy Lion Brand, a trusted name in the yarn industry, well known for high quality hand-knitting products since 1878. Our new Crochet Baby Blanket Kits from Ammee's Babies are the perfect gift for baby! You'll learn to crochet a hemstitch along the edge of the fabric, creating a handmade heirloom look. It's OK if you've never hemstitched before, because these kits include basic beginner instructions to get you started. This ready to crochet baby blanket kit includes a 100% cotton flannel receiving blanket, cotton flannel burp cloth, 1 crochet hook, 2 spools of 100% cotton crochet thread, and easy to follow instructions. These kits are creatively packaged in a ready to use gift box with ribbon and gift tag included. This is an ideal baby crochet kit for beginners and anyone with a busy schedule to create a special handmade keepsake for baby! The image to the left shows the finished hemstitch on baby's receiving blanket. Visit the Knit & Crochet Kits section of the store to see all of our learn to knit and crochet kits! Explore a variety of creative project ideas at Weekend Kits. We hope our selection of beginner kits inspires you to learn a new skill on your next Weekend at Home! 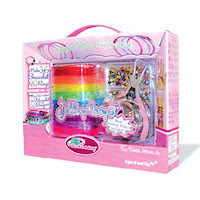 We have new jewelry kits in the Kid's Craft Kits section of the store. These kits will inspire your child's creativity as they learn new skills and create their own jewelry! The Flower Crochet Jewelry Kit from Alex is a fun and colorful kit that teaches kids how to make their own flower jewelry and accessories. This crochet kit includes plenty of yarn in a variety of tropical colors, a crochet hook, plastic needle, beading needle, beads, buttons, silk flowers, and easy instructions. Making flower jewelry is a great way for kids to learn to crochet. Kids will crochet necklaces, bracelets, rings, and hair accessories. This is a fun craft activity for friends to share during a play date or slumber party. They'll enjoy wearing the fashionable flower jewelry they created together! A nice feature of this kit is that all of the materials are neatly stored in a decorative carrying case. This also makes it a convenient craft for kids to take on trips. 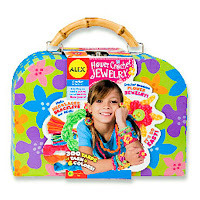 Alex craft kits are well known for their high quality and creativity. And, you never have to worry about losing your instructions because Alex publishes easy to access instruction sheets for all of their kits on their website. Just visit the Alex site and click on "Product Instructions". The Jell-loop-de-loops Jewelry Kit from The Bead Shop is a creative jewelry making kit for kids to create sparkle jelly bracelets and rings. This jewelry kit includes glass beads, bracelet wires, ring wire, sparkle tubes, and jewelry pliers - all the jewelry supplies they need to make 36 bracelets and 20 rings! Your kids will enjoy making bracelets and rings with this kit that includes everything they need. This is an ideal weekend craft kit for your kids to learn a new skill. You'll see their confidence build as they learn to create their own jewelry! Visit Weekend Kits to explore a variety of craft kit categories and get ready to have a creative Weekend at Home with your kids. 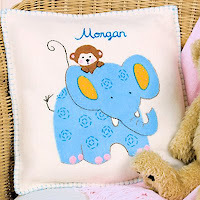 New Baby Cross Stitch Kits & Felt Applique Kits for Kids! You'll find a new collection of cross stitch kits for baby in the Embroidery Kits section of the store. The new theme, called Farm Friends, features a colorful ensemble of farm animal friends complete with those familiar farm animal sounds! This fun collection from Dimensions includes an embroidery quilt kit, birth announcement kit, and baby bibs kit. Make sure to click on the images below to get an up close look! 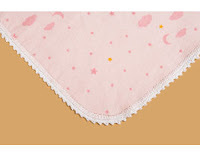 The stamped embroidery quilt kit includes a pre-quilted, pre-finished stamped poly/cotton crib cover, cotton embroidery floss, needle, and easy instructions. The cross stitch pattern is pre-stamped on the quilt in wash-away ink. You'll use the chart provided in the kit to select the right colors to cover the X's marked on the quilt. Your completed embroidered baby quilt will be a fun and colorful addition to baby's nursery! The counted cross stitch baby birth announcement kit includes 14 count white Aida fabric, cotton embroidery floss, needle, and easy instructions. 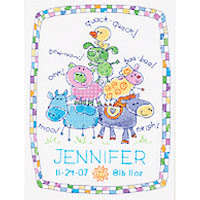 You'll receive an alphabet and numbers for personalizing your needleart with baby's name, birth date and birth weight. You'll use the chart provided in the kit to determine the colors and placement of your stitches on the foundation fabric. Your completed needleart will be a lasting keepsake of baby's birth! The baby bibs kit includes 2 pre-quilted, pre-finished poly/cotton baby bibs, cotton embroidery floss, needle, and easy instructions. Baby bib kits are an ideal stamped cross stitch kit for beginners. Kits make it so easy to get started! 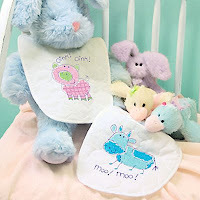 If you're new to stamped cross stitch, you may want to give baby bibs a try. They're small in scale and the X's are already stamped on pre-quilted bibs. The instructions provided in the kit will guide you through how to select your colors and make your stitches. If you're a beginner, be sure to visit the Dimensions website for step-by-step instructions and helpful stitch diagrams showing how to do stamped cross stitch. If you enjoy working with felts, make sure to see our new felt applique embroidery kits from Dimensions. These easy felt craft kits are great for beginners and ideal for anyone wanting to create a soft fleece blanket or pillow for a young child. Kits include printed fleece and felt, cotton embroidery floss, needle, and easy instructions. Toddlers will love receiving a cuddly blanket & pillow with colorful jungle animals made just for them! You'll find more jungle themed cross stitch kits in the Embroidery Kits section of the store. Before you start your embroidery project, you'll want to have a few embroidery accessories on hand, including embroidery scissors, an embroidery hoop, and a needle threader. Another handy item to consider is an embroidery organizer or tote to store your project and make it easy to carry along with you while it's still a work in progress. You can find all of these items and more in the Embroidery Supplies section of the store. Visit Weekend Kits to explore a variety of creative project ideas and get ready to learn a new craft on your next Weekend at Home! Apron Sewing Patterns - Vintage, Retro & Modern Aprons! We've added a new section of Apron Sewing Patterns to the store this week. You'll find a fun variety of apron styles, including vintage aprons, retro aprons, and modern aprons! You'll have fun choosing your favorite apron pattern, selecting just the right fabrics, and creating your own unique apron style. Sewing an apron is an easy sewing project for beginners, with many of the styles using a minimal number of pattern pieces and basic sewing techniques. Patterns include fabric and notion requirements, layout diagrams, and complete instructions. Some patterns will specify a certain type or weight of fabric, so you'll want to be sure to follow the designer's suggestions when selecting your fabric. There are apron styles to fit every occasion! Aprons serve so many purposes, from keeping your clothes clean to making a fashion statement. You may want to select a full coverage apron to use while cooking or crafting. Or, you may choose a half apron to wear over jeans and a t-shirt as a fashion accessory. There are so many choices! Choosing your fabric is one way to really make the apron your own. You may want to match your fabrics with the apron style, for example, by combining vintage inspired fabrics with a vintage apron pattern for an authentic rendition of a look from the past. Or, you could mix it up, by selecting modern fabrics and a retro style apron pattern for a fresh contemporary look. There really aren't any rules to follow. The fun is in creating an apron that appeals to your own sense of style! Here's a sampling of the variety of apron sewing patterns you'll find in the store. The Very Vintage Apron Sewing Pattern from The Apron Lady Designs is an easy apron to make. This vintage style apron features a scalloped overlay and extra long ties that can be wrapped around and tied in front. The Vintage Apron Ensemble Pattern from Vanilla House Designs features 3 vintage inspired half apron designs. These aprons are made using very lightweight fabrics for a delicate, feminine look. If you like the retro look, you'll enjoy the Retro Aprons Pattern Book from Taylor Made Designs. This book includes full size patterns, diagrams, and complete instructions for 3 full size aprons and 3 half aprons. Quality patterns are folded inside an 8 page softcover book. Make sure to see the Little Retro Aprons for Kids Pattern Book too! For a modern, sophisticated apron, you'll want to see the Mixing Bowl Beauty Apron Sewing Pattern from the Threaded Pear Studio. With this versatile apron pattern, it's easy to "Mix It Up" and create your own unique style by mixing and matching pocket styles, skirt length, and the detachable bib option. This pattern is fat quarter friendly, so if you have a stash of fat quarters, here's a great way to use them in style! The Reversible Apron Sewing Pattern from The Paisley Pincushion is a great basic apron style. This is an ideal apron for using themed or holiday fabrics. You can make them up to give as creative handmade gifts for friends and family! Fun Apron Blog to Share! Tie One On is a fun blog for anyone who loves making aprons. Every few months a new apron theme is announced. You make an apron according to the theme, send in your image, and it gets posted to a gallery for everyone to see. You'll be inspired by all of the creative entries! Make sure to visit the Apron Sewing Patterns section to see all of the new apron patterns. If you're looking for an apron pattern & fabric kit, visit the Easy Sew Kits section. Find a variety of apron patterns and kits at Weekend Kits and get ready to sew your own apron on your next Weekend at Home!